I have to admit that, in spite of the lovely Infantino/Anderson cover, this issue of The Flash bugged me just a tiny bit. It seemed that the editor and especially the writer twisted themselves into a pretzel concocting a story to facilitate the changing of Kid Flash’s costume with the resulting story being a somewhat pedestrian romp through yet another warring dimension (the sixteenth dimension, not to put too fine a point on it) who wants to invade Earth and whose upcoming invasion is tipped off by a friendly from the same dimension. In order to involve Kid Flash, he’s the one who is told that three super weapons have been sent to Earth to help us in our fight. 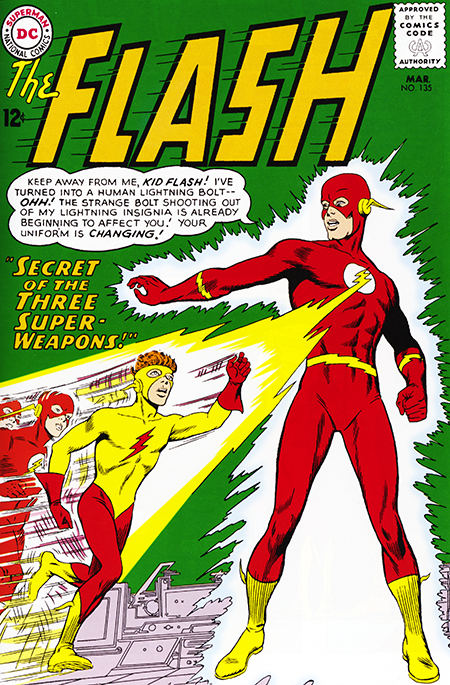 Turns out that they were mainly sent so that one of them, the mind over matter weapon, could change Kid Flash’s costume when, as the Flash is touching the weapon and coincidentally thinking that a new costume would be in order for Kid Flash, the Kid appears in new duds. Then, because their job is essentially done, the weapons are destroyed by the invaders. Kid Flash and the Flash then go on to defeat the invaders (who should have been dubbed the fashion police) anyway, and we’re back to peace on Earth. Except of course that Kid Flash is now decked out in different running togs. Now, I didn’t disagree with the premise that with the original costume of Kid Flash being the same as the Flash’s, things could get a little confusing from time to time. But it would have been a lot more interesting if they had used the turbulent-angst-ridden teenage years as the driving force for a costume change. Kid Flash could easily wanted to stake out his own territory by using the sartorial switch as a declaration of personal independence. That motive would have struck home with the book’s teenage constituency because, as I’m told by “experts”, we all wanted to be as independent as hell (okay, so maybe they were right). It would have presented the transformation in a much more realistic and powerful way. It’s the story I know I would have preferred to see then and now. Speaking of hindsight as I kind of obliquely was, in the closing panels, Wally is seen using a device left by Ryla, their sixteenth dimension benefactor, to communicate with her in her dimension. Rediscovering this image for the first time in decades, I was amazed to see how much it resembles a proto iPad. I wonder if Steve Jobs ever read The Flash?